Silfra is in the Þingvallavatn Lake in the Þingvellir National Park in Iceland. as the North American and Eurasian plates drift apart, the Thingvellir valley cracks further and wider, creating multiple stress rifts. The maximum depth followed by divers is 15 meters. To enter deeper areas, a conscious decision has to be made by the diver to enter small areas of deeper water, clearly visible. You cannot hit deeper depth by mistake, and certainly not if you follow our guide. Silfra is one of the few top diving destinations in the world that is also very safe, as there are no boats or other dangers on the surface to divers. If you have any problems during your dive, just come up. This is certainly a big relief to divers diving 4 degree water for the first time! The water in Silfra comes from Iceland's second largest glacier, Lángjökull. It takes the water 50 to a 100 years to reach the lake, and during that time it stays underground, or rather under lava. In the early years the ample water ran into the lake through a river. You can still see the old river bed to the right as you drive to Silfra. However, recent eruptions from the volcano Skjáldbreiður have closed the river off, and the only way to the lake lies through the lava field. How often do you get to drink water you dive in? When you drive to Silfra and park at the round parking lot, right under it is a large cave where the water from the glacier accumulates. That is one of the reasons why the water never freezes and mantains it's constant temperature of 4 celcius year round - the ample reservoir of water right next to Silfra acts as a thermal buffer, preventing water temperature changes. Diving in Silfra should not be attempted without a guide, especially if you have no previous experience diving in cold water. The path of the water to the lake takes many turns, and you should be able to navigate them expertly in case you need to exit the dive early. The Silver Lady, for that is what Silfra means, demands respect. Silfra consists of many different rooms and includes two smaller rifts. 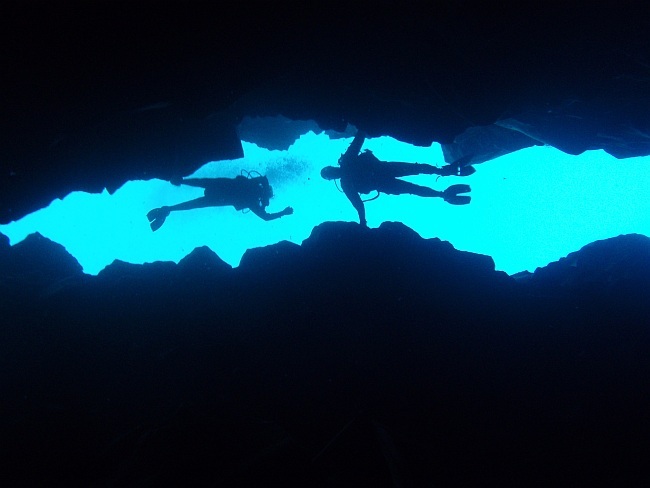 It is a multi-level dive, so diving Silfra means having good control of your buoyancy. As always, you should control your dive position in the water with your lungs first, BCD second, and drysuit third if you have little experience with drysuit diving. Of course, experienced drysuit divers adjust their position in the water mostly with their lungs and drysuit. When diving, you will be asked to perform a buoyancy check on the surface to insure that you can go down but are not overweighted. The cave, located under the parking lot and accessible from the first part of the dive, is off-limits to recreational divers. The second largest room in the Silfra rift, the Chess Room gets it's name from the lava boulders laying on the bottom. Some of them look like chess pieces due to their volcanic rectangular structure. You feel like you are in Alice in Wonderland or are surveying a place of a chess game played by Gods. This is your chance to prepare for the amazement of The Cathedral. The biggest room in Silfra, the Cathedral is Awe-inspiring. With depth of 20 meters at the deepst point and a lenght of 300 meters, you will be able to see it from start to finish thanks to the amazing clarity of Silfra's blue water. Look around and let it all sink in, enjoy the reflections on the surface of the blue crystal-clear water, but be aware that you might become disoriented as your mind plays tricks. Sometimes you can become confused where you are as your mind cannot discern whether you are in the sky or below it, this is what the feeling of flying is all about! The thing to remember form your dive briefing is as you see a sandy slope bottom come up, the first time you see Sand on your Silfra dive, you will be making a left into the Blue lagoon. A shallow lake with amazing visibility, the Blue Lagoon demands good buoyancy control from the diver. If you have any concerns with being able to do a proper frog-kick, with your fins higher than your head, you should do this part of the dive as close to the surface as possible. The Blue Lagoon is 2 meters deep on average, and you will not miss anything by going on the surface, and will save the amazing visibility for your second (optional) dive. As you prepare to exit your dive, remember to inflate your BCD jacket, hold your regulator in your mouth and to back up on the lava steps so that you can sit down and rest your tank. Once you are sitting securely, take out your regulator and take off your fins. If you need help with taking them off, our guides will gladly assist you. Remember not to climb out on the rocks with your fins on! You can now do the Walk of Champions back to the start of the dive, proud to be one of the few divers in the world to have dived The Silver lady, to have tasted her sweet waters, and to have held Europe and America as you dived between them!